Natural minerals & trace elements. Whole. Untouched. Complete. in proper balance are key to vibrant health. Supplementing with minerals depleted from our food can protect against the diseases of aging. People taking mezotrace® report dramatic help for arthritis, sports injuries, leg cramps, and more. 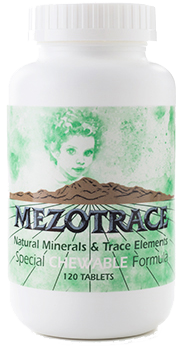 Replace the minerals and trace elements that have been depleted from your diet with Mezotrace’s pure, natural, and whole supplements. Mezotrace® is an abundant solution to multiple modern concerns in one compound. It is a mineral-rich calcium and magnesium carbonate substance that has been protected from and untouched by any modern pollution, and provides the most complete source of minerals known to exist. Some estimate that modern farming techniques have depleted so many minerals from the soil that the loss is as high as 85 percent, yet key elements, such as calcium and magnesium, are two of the seven minerals essential for the functioning of the human body. Mezotrace comes from the time when the dinosaurs roamed, the “Age of the Reptiles,” a period on Earth called the Mesozoic Era. Massive tectonic plate shifts of the time left great deposits of chalk, limestone, and carbon-rich shale. Encapsulated in rock formed from a freshwater seabed during the cataclysmic changes was mezotrace, a totally unique carbonate compound so rich in minerals and trace elements that there is nothing else like it on the planet. By cracking open the rock that encases mezotrace, the minerals are brought freshly into the world—and oxygen– for the first time in 200 million years. Learn more about Mezotrace. 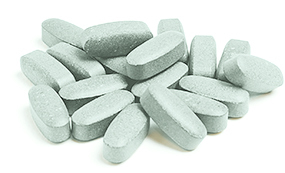 The USDA reports that 68 percent of Americans do not consume the daily recommendation for magnesium.. As reported in The Journal of Nutrition, researchers place this figure even higher, at 75 – 80 percent. A good mineral balance in your system will help maintain balanced health. Learn more about Mezotrace.